Auto Body Shop Insurance Insurance in Greater St. Louis Area including: St. Charles, St. Peters, Chesterfield, Arnold, Fenton, Sunset Hill - Five Star Insurance Agency Inc.
Keep in mind also that you may need separate coverage for your commercial auto's, workers compensation and group employee benefits like health and life insurance. Let one of our auto body shop insurance specialists find the right coverage for you today. 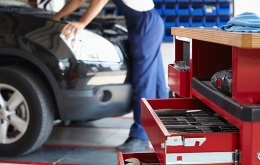 Contact us to find out more about auto service insurance in Barnhart Missouri including the Chesterfield, Fenton, Southern Illinois, St. Louis, and Sunset Hills areas.